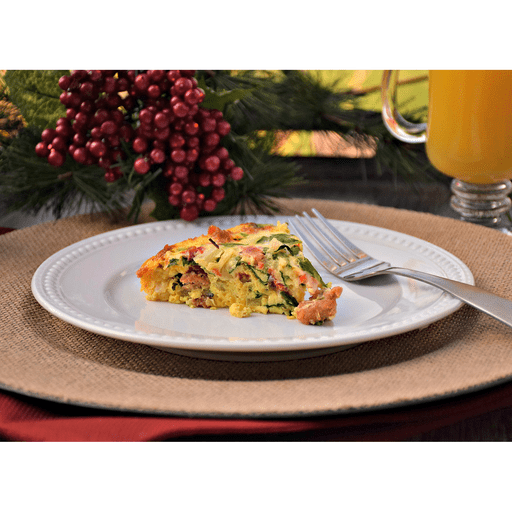 Filled with festive, roasted red peppers and bright, green spinach, this delicious Slow Cooker Holiday Egg Bake is sure to help make your holiday (breakfast and brunches) merry! 1. Coat a medium frying pan with cooking spray and heat pan over medium-high heat. 1. Remove and discard casing of uncooked sausage links, by carefully slicing the links in half, lengthwise, and peeling casing away from ground sausage. 1. Once pan is hot, add ground sausage and cook, stirring occasionally and breaking into small crumbles, until done, about 8 minutes. Remove from heat and allow to cool slightly. 1. Add eggs, egg whites, garlic powder, salt and black pepper to a medium bowl. Whisk to incorporate. 1. Coat slow cooker with cooking spray. Add spinach, roasted red pepper, onion, mozzarella and cooled sausage crumbles. Stir to distribute evenly. Pour over whisked egg mixture and cover slow cooker with lid. 1. Cook on low for 2 hours or until eggs are done. Serve warm. For dairy free: Omit shredded mozzarella cheese. Calories 210, Total Fat 8g (Saturated 2.5g, Trans 0g), Cholesterol 230mg, Sodium 470mg, Total Carbohydrate 5g (Dietary Fiber 1g, Sugars 2g), Protein 28g, Vitamin A 50%, Vitamin C 35%, Calcium 10%, Iron 10% *Nutritional values are an approximation. Actual nutritional values may vary due to preparation techniques, variations related to suppliers, regional and seasonal differences, or rounding.